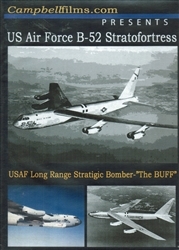 This DVD is a collection of vintage films on the amazing B-52 Stratofortress. When first proposed, the USAF thought it was just too big, too slow, and too heavy to be a reality. Almost 70 years later, the design was so good it is still flying today. We hope you'll enjoy! Film #1 - The Early YB-52 - The YB-52 was in question because of its incredible size and the fact that engines powerful enough to meet the required airspeed were not available. General Curtis LeMay insisted the project be continued as the new jet engines improved. This film has a lot of footage of the RARE early YB-52 models. Runtime is about 12 minutes. Film #2 - USAF's B-52 Story - A short film explaining the need for the B-52 and other SAC bombers. The B-52 was designed from the successful B-47 Stratojet. Runtime is about 12 minutes. Film #3 - SAC Command Post - As the cold war heated up, SAC had at least three B-52s in flight at all times in case of an attack by Russia. The B-52 was to be used as a retaliatory attack system if the Russians attack us first. Runtime is about 20 minutes. Film #4 - Nuclear B-52 - The B-52 was designed to carry nuclear warheads. This film explains the need for the B-52 to carry nuclear warheads and the safety systems to prevent a nuclear accident. "Here are the facts"! Also shows the B-52 in flight and practice bombing. Runtime is about 12 minutes. Total runtime for the Boeing B-52 Stratofortress DVD is about 84 minutes. Format is NTSC DVD and region-free.